Computer science student, I like to code, fly planes, and learn about our beautiful universe. OrbitDeterminator is part of the bigger DGSN project by AerospaceResearch.Net. The Distributed Ground Station Network will be a network of thousands of ground stations across the globe. Together, these ground stations will track satellites cheaper and faster than conventional tracking stations. It will also get ordinary citizens involved in real space missions, so it is a win-win for everybody. My mentor was Alexandros Kazantzidis. He alongwith Nilesh Chaturvedi had worked on the preliminary orbit determination part last year. However the results could be improved. So I worked a little on that, but my main contribution was on real time tracking. As a side project I made a web application for one of the modules. I also cleaned the repo by adding a gitignore file and removing all temporary and IDE files. This should be enough to get one started. For more help you can check the documentation. Last year two methods of filtering were developed – the Savitzky-Golay filter and the Triple Moving Average filter. 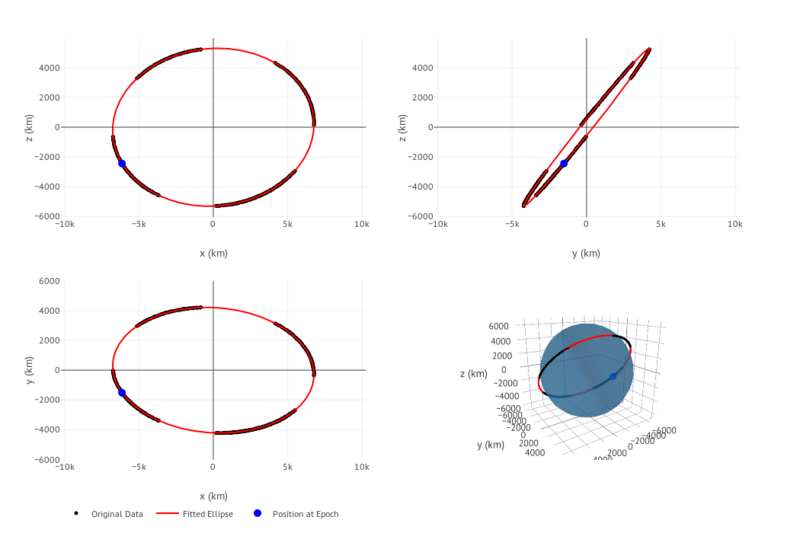 Two methods of orbit determination were also developed – the Lambert’s method and an interpolation method. However, they were not giving good results for certain kinds of data. I made a new algorithm that fits an ellipse to the data, similar to fitting a line to a set of points. It gave better results than the previous algorithms so we decided to continue with it. 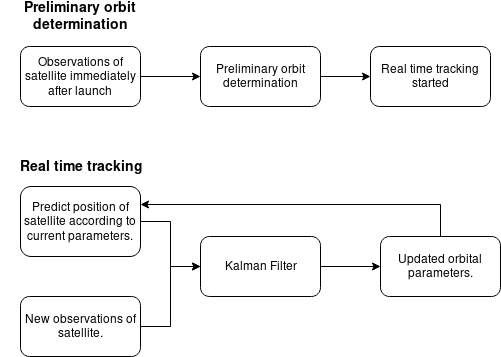 The real time tracking consists of two parts – propagation of state vector and the Kalman filter. 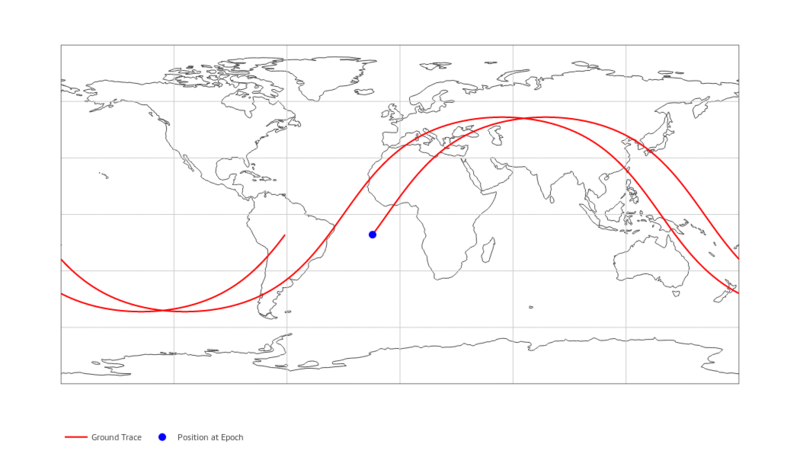 For propagation we decided to use the SGP4 algorithm. It did the propagation excellently but was not stable with the Kalman filter. So I made a simple propagator. It uses numerical integration and takes into account atmospheric drag and the oblateness of the Earth. After making it I spent a lot of time testing it. The only major problem was that the time period did not match with the real time period. A simple fix for this was to manually fiddle with the semi-major axis of the satellite until it gives the correct time period. I tried a lot to fix this problem, but could not do so. Anyway, since it was working well with the Kalman filter, we decided to continue. The simulator in action. It is printing the coordinates every second. Plotting the data produced by the simulator. After all this the Kalman filter was left. This was quite straight-forward. I directly implemented the equations on Wikipedia and it worked quite well. However if a time varying covariance matrix is used, it will give better results. As a side project I made a web application for the ellipse fit algorithm. We created a new repository for this because it is not a necessary component of orbitdeterminator. It is made using the Dash library. 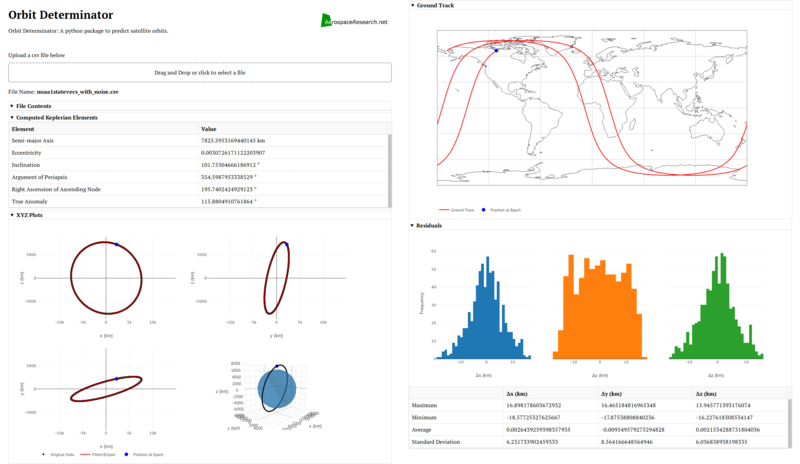 Upload a csv file, it will process and give the orbital elements alongwith beautiful graphs. 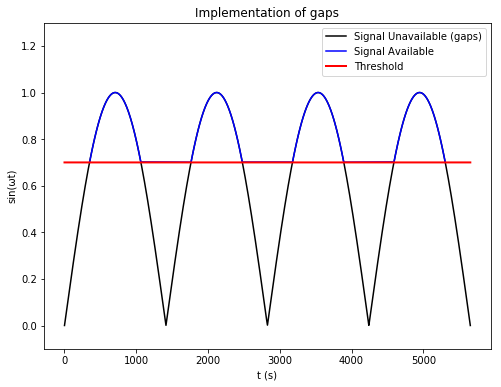 Integrating Aakash’s SGP4 module with the Kalman filter. Fixing the time period problem in the numerical propagator. Testing the system with real observations. Deploying the web application on a public server. After the implementation of the Cowell propagator, it was time for the Kalman Filter. It is an algorithm that uses a series of measurements observed over time, containing statistical noise and other inaccuracies, and produces estimates of unknown variables that tend to be more accurate than those based on a single measurement alone. A Kalman Filter is the ideal filter for a linear process having Gaussian noise. Since our process is not linear, a modified version of the filter must be used. This is called the Extended Kalman Filter. It linearizes about the point in question and applies the regular Kalman Filter to it. A function f which outputs the next state, given the current state. The matrix F which is the jacobian of f .
The matrix H which converts state into corresponding observations. A matrix Q denoting process noise. It consists of the inaccuracies in the model. A matrix R denoting measurement noise. P – covariance matrix of x. It denotes the inaccuracy in the estimate. As the filter runs, P is supposed to decrease. K – the Kalman gain. This matrix is between 0 and I and denotes how much the observations can be trusted vs how much the model can be trusted. Predict – in this step, we predict the next state (x) and covariance matrix (P) using our model. Update – in this step, we update our estimates of x and P using observations (z). Last time when we tried to use the SGP4 propagator in our Kalman Filter, we ran into problems. This was because you can’t stop the algorithm at a certain stage and continue from there. Suppose you want to propagate from to , you can directly propagate from to but you can’t propagate it from to to . So I set out to make our own propagator taking into account two major perturbations – oblateness of Earth and atmospheric drag. Instead of making an analytical propagator like SGP4, I went with a numerical one because that can be stopped and started at any point. So the first challenge was making a numerical integrator. Numerical integration are used to integrate a differential equation from one point to another point. I studied and tested various integrators and finally settled on Runge-Kutta 4th order integrator (RK4). Let the initial value problem be and . This form can be directly used in the RK4 integrator.